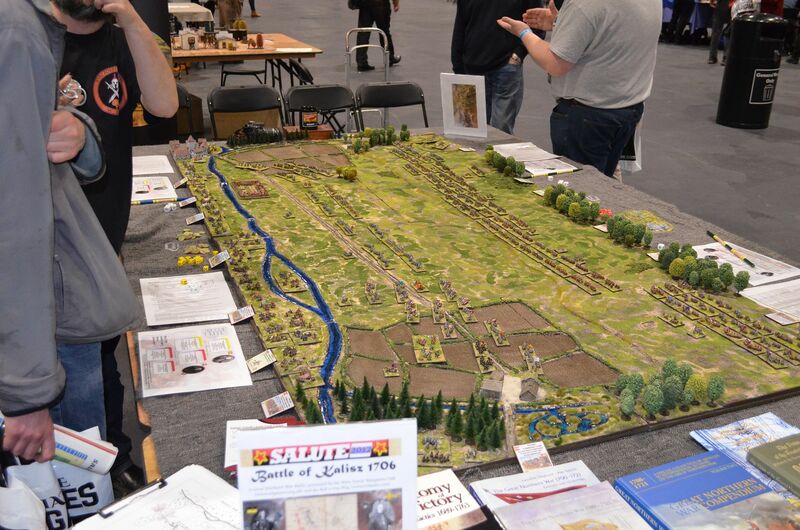 The club will be running Kalisz 1706 at Salute this year - table GG15. Come and say hi if you go. Some pictures of the game at Salute 2017, these are from others - later I will post some I took. First of all a little background on the battle, which will hopefully help make sense of the pictures. In the battle the Swedes were fighting with their Polish and Lithuanian supports against a army consisting of Russians, Saxons, Cossacks, Kalmucks and their Polish and Lithuanian allies. The Swedes and their allies were surrounded by their enemies. They deployed facing the Russians, Saxons and Polish/Lithuanians but behind them were the Cossacks and Kalmucks waiting to complete the destruction of the Swedes and their allies. So in short we have 3 main groupings. One group of anti Swedish facing their opponent and another behind them & facing the rear of the Swedish led army. The Swedes and their allies are sandwiched between these two groups. A nice overview of the game from www.blmablog.com/2017/04/salute-2017-photo-review.html. It shows the two main forces closing and offers a good view of the 3 main groups. Some nice pictures on a tweet. Are these Per's 6mm figures? Looks a pretty impressive set up. Yes all Per's stuff and it looks even better 'in the flesh'. He will have a new ones for Joy of Six in July.